Frames allow displaying more than one HTML document in the same browser window. If your browser window's broken into one or more parts, and each one's like a separate web page, which can be scrolled independently, the site most likely uses frames. You can also detect such a website by clicking on different menu items and tabs and navigating through it. If the URL does not change — Bingo! The website you are browsing is built with frames! 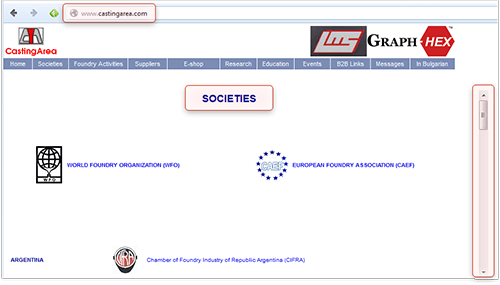 In the example above you can see that although we are in the "Societies" section, the URL in the address bar has not changed a bit. There's one more drawback websites with frames have. As you've already learnt, Search Engines typically look for text that describes what each page is about, and for hyperlinks leading to other pages of your website, so you guess right! both of these are missing from a standard frameset document. Hence, if you use frames, Search Engines will fail to properly crawl and index your valuable content. You can rebuild your site and remove frames completely or at least use the noframes tags. What are these? Noframes tags are special ones that help Search Engines easier crawl your page. I'm sure your webmaster knows this and will add noframes tags easily. Why is flash bad? Because if you have some text in it, Search Engines won't recognize it (ok, Google claims to recognize it, but we, SEOs, do not rely on that too much). You can make amazing flash animation, and put a fantastic message in it, and use nice links with good use of keywords... But for Search Engines it will be just a set of images, no keyword–rich content or anchor texts, and absolutely no way for the Robot to know what your site's about. Sure enough, these elements should be optimized as well, but let's not run before the hounds. I guess you also saw a thing like this: you load a site and all you see is a picture saying something like "Welcome to this cool website." To come to the website, you need to click a link somewhere on the Welcome page. Honestly, I hate Welcome Pages. Most Internet users hate them. And, the Robot hates them, too! Yes, even though he's a patient guy, welcome pages are getting on his nerves. And what about normal people, huh? Making a visitor come to a Welcome Page is as weird as what I imagined now: say, you're going to Las Vegas, but before you come there, you have to stay for a day in a tiny place called "Welcome to Las–Vegas City" City, with no alcohol, no women and no casinos — and only then you can go to Las Vegas itself. Who would do that?!? To cut it short, Welcome Pages only do harm to your website sales and irritate users. So if you have a Welcome Page and there's a way to kill it, don't wait to do that. DO IT NOW! If you have a Welcome page, and it's possible to remove it — remove it! You know what a broken link is and how bad it can be? Well, I'll tell you. About a month ago, I was driving to Walker River, NV. Just wanted to see the place, as my granddad came from there. I only had a 20–year–old map of the place, and it turned out to be too old: On the way I chose, the bridge was broken quite long ago. Well, I was a bit disappointed and had to take another road. But what if it weren't me on the broken bridge? The Robot would try to find another way to go. But he's not that determined to visit all your pages. In the case of a broken link, the Robot may simply leave the page not crawled. And what is actually a broken link? A broken link is the one having some elements incorrect or missing from the link's HTML code, or a link that leads to a non–existing web page. Now what you have to do is check your pages for broken links — and fix them. DO IT NOW! Find and fix broken links on your web pages. Upload the changed pages to your web server. Psst! There's one secret I have to disclose at the end of Chapter 2. 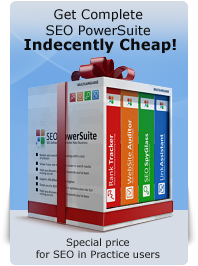 It tells how to discover all of your website issues in a single click. Too impatient to learn? Then get to the chapter 2.3.12! Next: Get rid of duplicate content and What is rel = "canonical"? Yeah!avoid to put flash image.but if we still want to put it at our blog just put it at footer not at the top.our website will loading from top to footer. but here i still need java script.if i am not mistake google adsense provided java script to view the ads at our blog,right? The only way out I can see is to use a different website editor that gives you access to the HTML code. They will be considered as frames only if you use the tag somewhere in the code. Frankly, I'm not familiar with the SpryMenuBar, maybe you should try asking this question on some Dreamweaver related forums. Can anyone clarify .... I use dreamweaver cs4 to create pages via templates that have a header, footer, body and 1 rightsidebar. Also, does anyone know if using the SpryMenuBar (which I beleive is Java) is safe or a no no? I know I answered my own question however, just wondering if some Java is Friendly - such as the SpryMenuBar that comes with Dreamweaver? What does one do when you are using a web site editor which has a user friendly front end, and then generates the HTML for you on the back side. You can't get access to it or change it if it has a problem. I suggest not to use Html Converter, its good to write your own code, if not, you cant control what happens, its not that difficult. look at http://www.chip.de/downloads/HTML-Editor-Phase_12999519.html, a very useful tool!! The announced news sounded great, as this will most likely let site owners create dynamic content and increase their conversions without (supposedly) compromising their rankings. On the other hand, this will hardly change much in SERPs (in fact some possibilities for creating RIA already work, but this didn't change the SERPs much.) Those sites that're well optimized without dynamic content shouldn't worry about their rankings. What are your thoughts on the PR in July of this year by Adobe announcing their work with the search engines regarding advances in recognizing dynamic web content and RIAs. "CSS Validation Service" also have to do. Image links can work, if you use the Leahy Image Replacement Technique. This uses standard text links, but allows CSS to replace the text with a graphic. That's acceptable to SEs and accessibility people, and can make for a better looking site.